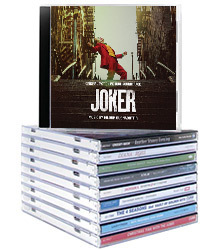 Alliance Manufacture on Demand program allows us to carry every music and movie title available, extending the life of physical media. Our MOD program maintains the life and viability of physical CDs and DVDs by preserving and expanding titles currently available to consumers today. We make on-demand at the time of your order. So, we’re never in a stock-out position on any title. You can market these titles with the confidence that your orders are always immediately fill-able. No minimum order quantities. You can take orders as you sell them, or keep modest inventories if you like. No more valuable capital sitting on your shelf collecting dust. Generate more revenue with minimal risk or investment. Zero inventory means you can add titles for just the modest cost of adding SKUs to your website or catalog. On-Demand titles command higher price points. When you don’t have excess inventory flooding the market, and you’ve got classic and out-of-print content consumers have been waiting for – you get to sell it for full price. Less competition. You won’t find these titles in big box stores or mass merchant retailers. They’re only found online, or in specialty brick and mortar stores. MOD has reached the tipping point and is becoming main stream. Internet and specialty retailers who don’t market MOD titles are missing out on the fastest growing segment of the packaged media industry. New titles are made available weekly.